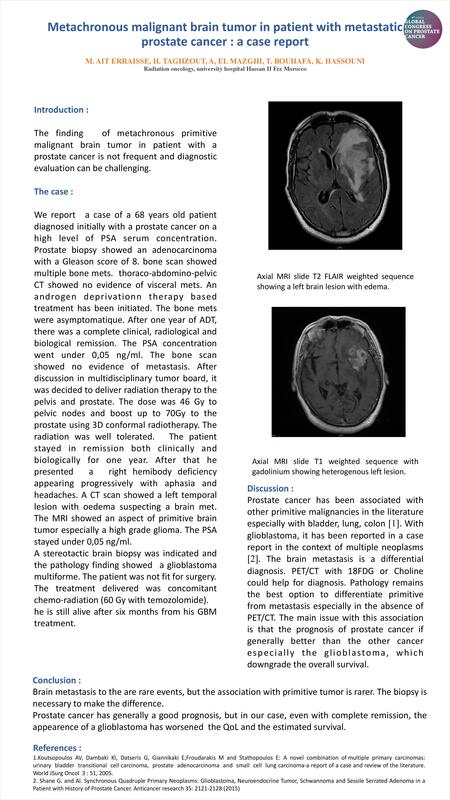 The finding of metachronous malignant brain tumor in patient with a metastatic prostate cancer is not frequent and diagnostic evaluation can be challenging. We describe a 68 years old patient diagnosed initially with a prostate cancer at the stage of bone metastasis. After one year of androgen deprivation, there was a complete clinical, radiological and biological remission. we decide de give radiotherapy to the prostate and pelvis. one year later, the patient presented a right hemibody deficiency with a brain tumor surrounded with oedema at the CT scan. The MRI showed an aspect of primitive brain tumor. He had chemo-radiation for his brain tumor. he is still alive after six months from his GBM treatment. Prostate cancer has generally a good prognosis, but in our case, even with complete remission, the appearence of a glioblastoma has worsened the QoL and the estimated survival.